before we eat fried things covered in cheese, sign up at the bottom of this page for weekly email update from a Woman Who Eats. Cheddar cheese is to cheese fries what middle school is to life. You deserve cheese fries that are out of their awkward phase, ok? These cheese fries are at least in college, possibly in graduate school. Parmesan cheese is magical! Did you know this? I'm here to teach you how to harness the magic of parmesan cheese, combine it with the magic of fried potatoes, and then take over the world. The magic is this: When you melt parmesan cheese correctly, it turns into frico, which is a caramelized, crunchy, chewy, awesome form of parmesan cheese. It causes fries to be able to stick together in a sheet of goodness that can be topped or eaten alone or hung on your window as a curtain. This is fried food season, right now. The North Carolina State Fair is all up in the scene, which means we are all getting our nosh on in order to develop the healthy pudge that will take us through the cold months. This is a great gateway pudge-maker. Cheese fries are normally a globby, sticky mess. The cheese is always unevenly distributed, leading to some bites that are soggy and some that are cheeseless. This recipe combats these issues for a superior cheese fry experience. I liked these fries plain, in the pieces that naturally fell apart. You could also add extra extra cheese and cut the sheet into uniform slices. Ideas for toppings include tomatoes, prosciutto, bacon bits, tomato sauce or mustard. Any combination of these or other toppings would also be acceptable. jump into this fry pile like you would a pile of leaves. Most importantly, though, these fries are intended to be shared. One of my very best friends makes a great fry-eating partner because she likes limp fries and I like the crispy ones. Go ask all your friends who likes what type of fry and find someone whose preferences compliment your own, then make these with them and loaf around on the couch and act like children. These fries are grown up so you don't have to be. Spread fries on parchment paper and place on a baking sheet. Cook according to instructions on package. You could make fresh ones but really, let's just leave well enough alone. When they're done (normal-done, not extra crispy-done), remove from oven and turn temperature to 350 degrees. Grate your hunk of cheese directly on top of fries using a handheld cheese grater or rasp. A spinning grater or even a zester will work in a pinch, but the cheese will melt and caramelize better with a smaller grate. Cover all the fries in a hefty, even layer of cheese, making sure to get the corners. If you feel like it's not enough cheese, you're probably right. Bake for another 10 minutes or so, checking every few minutes to make sure they're not burning. You'll know the cheese has frico-ed when it is past the point of being melted - the edges will be golden brown and the center will have a pattern of tiny holes in it. Wait about 5 minutes. 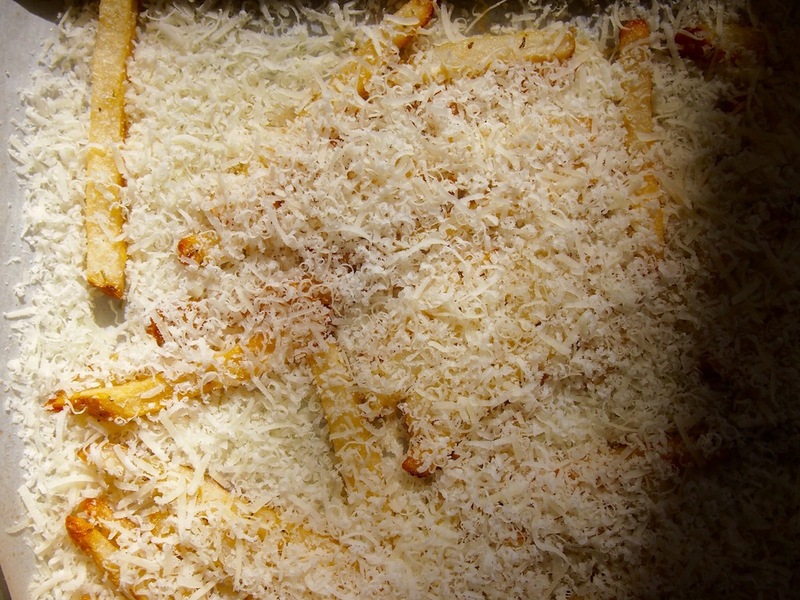 The fries should all be connected in a big sheet of parmesan-y goodness, which will slide off the parchment paper onto a plate very easily. Rip apart with your fingers or slice and top, then serve while still hot.